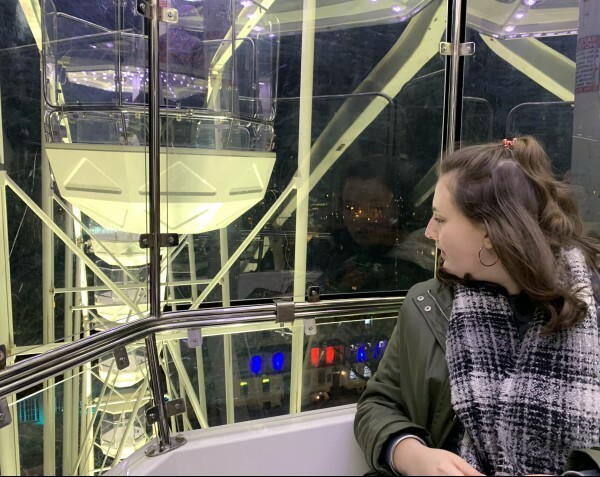 With less than a week to go, we definitely recommend taking a trip up the giant observation wheel, organised by Cheltenham BID. The wheel stands in Imperial Gardens as part as the Light Up Cheltenham event with amazing views across Cheltenham. Its the first time a wheel, standing at more than 35-metres high, has come to Cheltenham. Here at glos.info we were lucky enough to take a trip up! The wheel itself was extraordinary! The giant structure lit up the whole of imperial gardens, giving it a glow. The entire ride was around 10 minutes, travelling around 3 times. This allowed me to enjoy the ride and observe the views across the town centre. Below I could see the High street, Promenade and the Town Hall. Each time I went round I spotted something different and intriguing. It gave me a different perspective of Cheltenham. 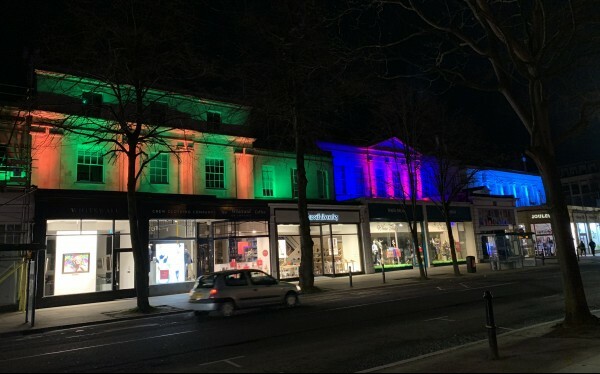 Various buildings around town were floodlit as part as light up Cheltenham, revealing bright colours across the face of the buildings. 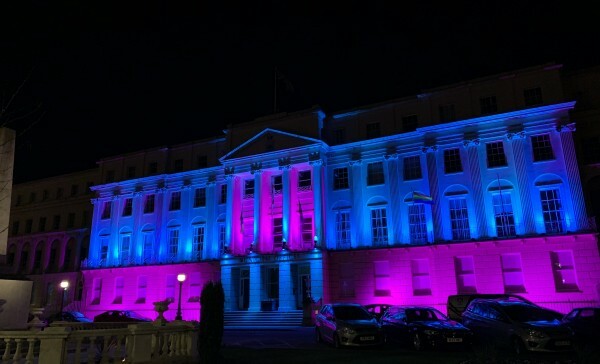 The Town Hall, Neptunes Fountains, Boots corner and the council’s Municipal Offices looked beautiful with different colours shining across. The colours have been changing throughout the whole event and were changed to red on Valentines day. It was amazing to see the town lit up and shining so bright. This week is half-term, giving you and your family the perfect opportunity for an afternoon outing up the wheel. The views and experience are definitely worth it, even if you are scared of heights! The wheel operates from 3pm every day with extended operating times at weekends and throughout the half-term holiday. The ride costs £5 for an adult, £4 for a child and a family ticket is £15. 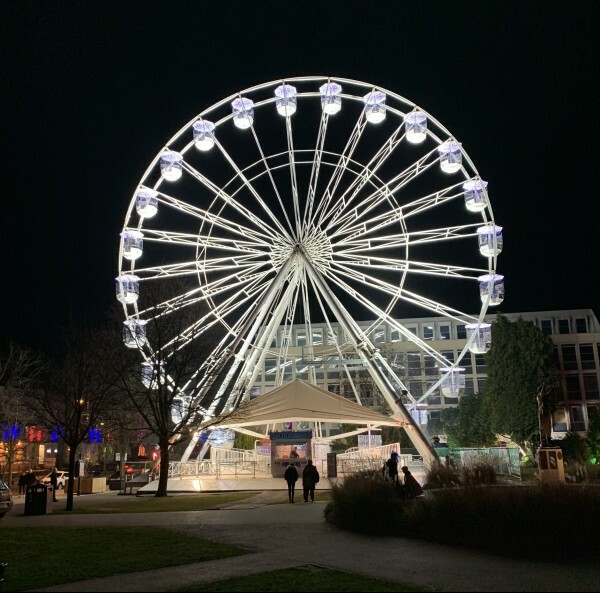 This review of the Giant Observation Wheel and Light Up Cheltenham is brought to you by Connie Ashton on behalf of www.glos.info.